I bet you weren’t a professional photographer for very long before you found yourself caught in the inevitable turmoil of pricing your photography. On top of that, there’s the initially often-overlooked problem of knowing how to present your photography price list to potential clients. For some reason, creating a price list of products and services presents a nightmare for the average person trying to navigate the treacherous waters of being a professional photographer. First, there’s the question of exactly what prices to charge — should they be attractively-low to get more clients, or are higher prices that reflect the value of your work better? This is quickly followed by the problem of how to put those photography price lists in front of prospects, without appearing to pressure-sell them into buying something they don’t want or think they can’t afford. As a photography coach, this topic pops up frequently in my strategy coaching calls, so I’ve compiled the best ideas on dealing with the necessary evil of the photography price list for you. 4 Ways Your Photography Price List Kills Your Sales! Unfortunately, these 4 methods caused sales to suffer! I would indiscriminately hand out price lists to prospects who asked for them, count the number of hits to my price list web page, or email my price list to anyone who requested it. Unfortunately, most of those prospects disappeared as quickly as they came. 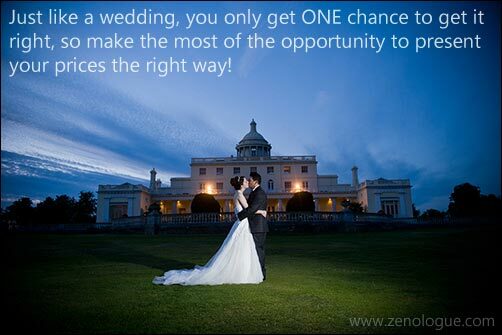 This was especially true as I was learning how to price wedding photography and actually book weddings, for example. Right then, being in the photography business seemed like a poor choice! A Magic Sweet Spot With Your Photography Price List? With the thought of all these disappearing prospects fresh in my mind, I took a long hard look at my price list, and I started to imagine that my prices were too high. So, I made the terrible mistake of lowering them and trying again. Yes, you guessed it – I saw just the same result; people would see the prices and then disappear. If we aren’t careful, we can get caught up in a terrible cycle of continually fiddling with our price list, frantically trying to find the sweet spot. But such a sweet spot doesn’t exist! Are you stuck in the no-man’s land of second-guessing your prospects, trying hard to discover what you think they would pay, rather than what you think they should pay? 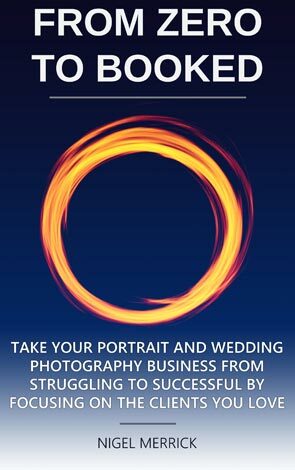 If so, you’re not alone – just about every photographer I know has been through this painful process, including most of the photographers I talk to in my business coaching sessions. The solution requires three separate things. Decide where you are going to position your photography business in the marketplace (branding and marketing), and what your services and products are going to be (i.e. what it is you’re actually selling). Calculate your fees, based solidly upon your operating and sale costs, your income personal requirements, and what your photography studio needs to prosper. Finally, you should print ONE price list, which remains solely in your possession, and never leaves the studio. This means no one sees your full price list unless you personally show it to them, together with a full and complete sales presentation of all the photographic services and products you have to offer. There’s a perfectly good reason why the other methods of presenting our photography prices are ineffective. When someone views a website and finds a price list, they can immediately see how much an 8 x 10 print or a wedding collection is. But – how are they going to compare it with something they’ve seen elsewhere, except by the price, print size or package contents? Suddenly, your prospect has been magically transformed from someone looking for sensitive, emotional photography into a robotic price comparison shopper! In the mind of most people, all 8 x 10 prints are created equal, based on the printing cost, which couldn’t be further from the truth. It’s what is printed on the paper that’s important, not the paper itself. It’s impossible to intervene and explain this to an anonymous web surfer, or someone just sitting at home reading a photographer’s price list they picked up from somewhere. Wedding collections are an even more extreme example. Displaying the price for a package on a website or in a brochure they can take away is only going to make the prospect think, “well, I get such and such for this price, but another photographer over there will give me x and y for less….” We both know the “other” photographer isn’t going to put as much effort into their wedding day as we are, doesn’t have the same experience, won’t deliver as quickly, or simply isn’t artistic. But the potential client isn’t thinking like this anymore. They’re only comparing one photographer’s price list with another and trying to make a decision based only on the numbers. The same applies when someone calls you on the telephone. The first question they usually ask is, “What are your prices? How much?” If you answer these questions straight away, they’re gone, and you’ll never hear from them again. Instead, we must divert the conversation away from price (at least at the beginning of the call) and on to the emotional reasons for the photography they’re looking for. Once we’ve had a chance to educate them about what makes us unique, then we can gently introduce them to our fees, after which we arrange to meet them personally for a more in-depth chat if our price happens to fall within their budget. By the time the client meets with you for a chat, they already know your fees are affordable to them. There Can Be Only One Photography Price List! As you probably expect, I meet with every client I work with before I allow them to book a session or wedding. Apart from being able to meet them face to face, this is an opportunity to give my full sales presentation before introducing them to my full photographer price list. As a professional salesperson, it’s also my responsibility to make sure I understand as much as possible about their needs before trying to sell them anything. When it’s time to discuss fees there’s one copy of my price list, printed on fine parchment paper in a leather folio. To the client, there’s no doubt it’s an official copy, and no one has ever asked to take it home or borrow it. They simply take notes as we go through it, but they don’t get my actual price list under any circumstances. If I’m meeting with a prospect to discuss a wedding, for example, it may be 45 minutes to an hour before we start talking about price. They can see the folio with the price list there on the table, they probably know what it is, but I don’t open it until I’m ready to show it to them. If they ask about the price list, and I don’t feel ready for them to see it yet, I simply say, “I’m glad you brought that up, and I’ll be happy to go over my price list shortly. But first…” and then I ask them another question about the wedding. By the time the discussion does get around to the wedding collection price list, we’ve already talked about the wedding day, how the couple met, what they like to do together, what’s important about the wedding, how many bridesmaids & groomsmen they have, the color scheme etc. At that point, they know I truly care about them and their wedding plans, and price is no longer a primary driving force. Obviously, they will still have a budget in mind, but they’re no longer simply crunching numbers and comparing our prices to someone else’s. They are making a comparison – but it’s more to do with service, quality, attention to detail, personality and so on. Which Way Up Is Your Photography Price List? When I guide them through my photographer price list I start with the most expensive option first, no matter if they’ve already indicated a specific budget. This way, I only have to sell from the top down, and not the bottom up, which is much easier! Don’t be tempted to make the terrible mistake of confusing this process for pressure-selling, because it isn’t – far from it. The purpose of selling down is to help them buy a collection that’s appropriate for them, even if it does happen to be the least expensive one on offer. For example, if they had a budget of around $2,500 and I were to only show them a package for that amount, they might automatically perceive it as “expensive” and will be more likely to choose the one below it, which may not suit their needs as well. However, if I start at the top and work down, then they’re more likely to choose a more appropriate package. Marry Me & Get A Birthday Gift! Imagine you’re looking for a romantic partner, so you register on a dating website to try to find the ideal person. The site is unusual in that there are no photographs and no information about any of the people on there. The only clue you have about anyone is how much he or she would expect you to spend on their birthday present. How would that affect your choice? Wouldn’t you be more interested in finding out about their personality, character, age and looks? The same principle applies to selling photography. The prospect or client doesn’t understand as much about creative professional photography as we do, so they may not understand the unique factors they ought to be concerned about the most. Instead, they get hung up on the only thing they can relate to, which is the price. At the end of the day, it’s our job, as sellers of photography, to unhook them from the price, and re-connect them with the real elements of what we do. I have only one printed price list I show to prospects – there are no fees on my website, no price lists emailed out to those who request them, no detailed charges given over the phone without a sales presentation, and no brochure with a few photographs and a price list for them to take away. By treating my own prices with the respect they deserve, others will do likewise. I’m not hiding anything from my clients or trying to deceive them in any way. But, it does demonstrate that I value them personally, and their individual needs, above the fees for my services. It also helps to screen out those types who I don’t want to work with – the ones to whom price is the only important factor and to whom values of family, relationships, emotions and memories are not as important. So far, no one has complained about this procedure, or made any negative comment about it. People understand the context in which my fees are given, leading to better sales and, in my opinion, an overall better experience for the client.